This Dermatologic, Laser & Vein clinic opened it’s doors in 1994 in Kelowna and was one of the first clinics in the country to offer laser skin treatments including laser hair removal. Since that time we have expanded to include all types of medical treatments that focus on minimally invasive techniques that do not require major surgery. Patient safety, excellent results and client satisfaction are all of paramount importance for us at DermMedica so come see how we can rejuvenate the skin you are in. 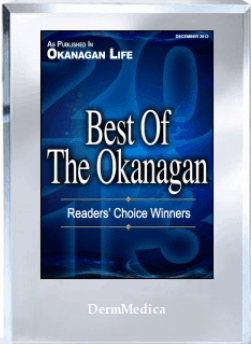 Following the publication of DermMedica’s selection for Okanagan Life’s 2013 Best Of The Okanagan list, American Registry seconded the honor and added DermMedica to the “Registry of Business Excellence™”. An exclusive recognition plaque, shown here, has been designed to commemorate this honor. For more information on DermMedica, please call 250-868-3070. From all of us at DermMedica, Thank-You.